The last couple of weeks have been awash with examples of counter-attack plays. Below you can find two alternatives routes for goal. FC Porto's Colombian winger James Rodríguez is still young (20 years-old), but during the past year has been proving how good he can be (and how much better he may turn out to be). In a potentially title-deciding match between Benfica and FC Porto, he came on as a substitute on 58 minutes when his team were trailing 2-1 and was decisive for FC Porto’s victory, scoring a goal and providing an accurate assist for the late winner. 1st moment: Fernando, FC Porto holding midfielder, wins the ball back with James’ help. As you can see in the picture below, they both have loads of space to run into. 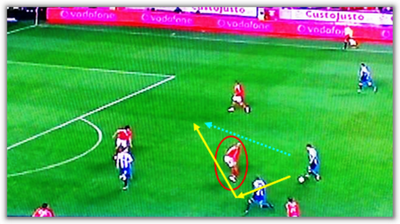 2nd moment: In fact, they were able to win the ball back 60 yards from Benfica's goal and push forward at ease - they weren't up against any opponent until Luisão (in red) came out to meet them, near the box. Noticing the space behind Luisão, James played a simple one-two with Fernando (who had accompanied James in his run upfield). 3rd moment: With that simple one-two, James outplayed Luisão, picked up the ball a few yards farther up and unleashed an unstoppable effort into the goal. The score was level again. The last match between Arsenal and Tottenham started at lightning strike pace. 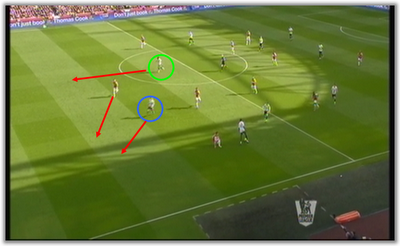 Tottenham's third-minute goal was textbook breakaway play - in a collective effort that should be praised. 1st moment: Tottenham right-back Kyle Walker (blue circle) makes an interception, passes the ball to Gareth Bale (first dotted yellow line) and immediately starts sprinting. When the ball gets to Bale, Adebayor moves to the left to meet Bale's pass (second dotted yellow line), dragging the defender out of position. Notice how Saha (green circle), the player who would eventually score the goal, is all alone. 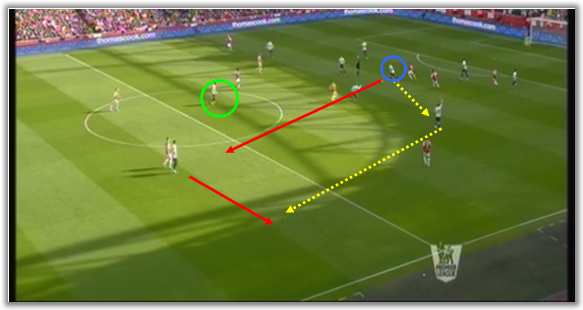 2nd moment: Walker (blue circle) continues his movement and drags the second centre-back with him, leaving acres of space for Saha (green circle) to run into. 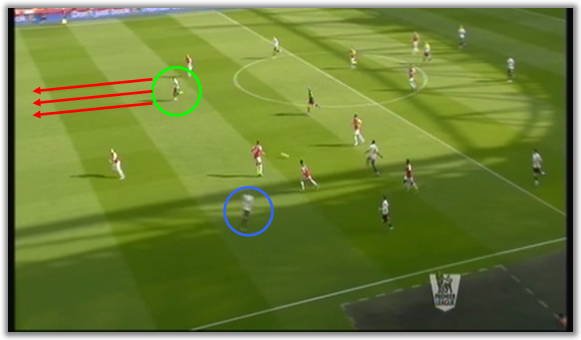 3rd moment: Walker (blue circle) finishes his run knowing his job is done: When the second Arsenal centre-back notices how much space there is left behind him, it's already too late and Adebayor has already passed the ball to Saha (green circle). A few seconds later, Tottenham were in front. Both these cases are a perfect example of how to make the most of a quick transition from defence to attack, showing how important it is never to lose your team's balance, even - or especially - when the ball is yours.